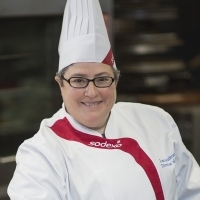 As the Director of Recipe Management, Lisa currently oversees Culinary Systems for Sodexo North America. Her team manages recipe data, menu architecture, and nutrition services, as well as assists with ingredient selection and culinary development, for all of Sodexo’s market segments. A graduate of the Culinary Institute of America, Lisa has over 30 years of experience in all facets of food service management. As a Certified Research Chef, she specializes in product and concept development. She is also the Plant Forward Working Group Co-Chair for both the CIA’s Healthy Menus Research & Development Collaborative and CIA’s Healthy Kids Collaborative.